In case you’re more of a reader than a watcher, I thought I’d post the list here for you as well with Amazon links. While Amazon is by far the most convient way to find these books, I also wanted to let you know that I have found some of these books at Marshalls, the Dollar Store, and my new discovery (Amazon) Prime Used. Also don’t forget about your public library! 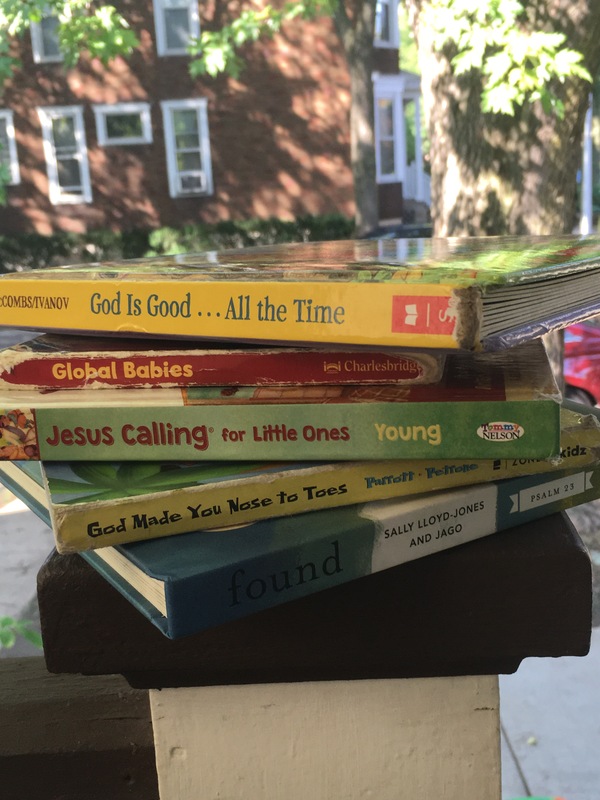 Below are my top five (Christian) books for babies…though my very favorite is not explicitly Christian. My criteria for judging the top five are 1) Diversity is represented 2)Simplicity 3) Basic Message of God’s Love. Simplicity is important because if you’ve ever tried to read to a child under three, you know less is more. The fewer the words, the more likely your child will focus on the book. Some of these books are on the longer end for board books, so I often read just one phrase per page. 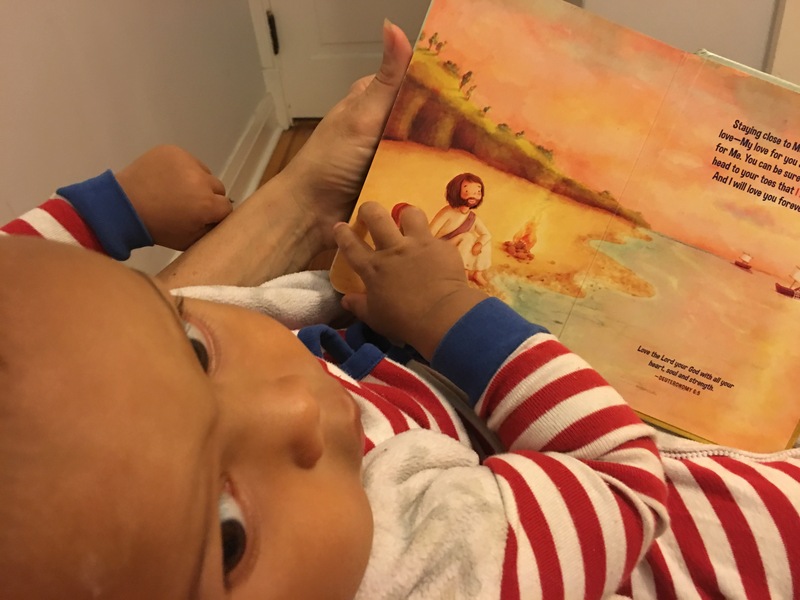 Finally, while silly books are great for bonding with babies and even for passing on a love of reading I was looking for books that instill the basic truth that each child is wonderfully made and loved. Babies aren’t going to get a complicated teaching, but “I am loved” is the gospel even the youngest child can receive. God Made You Nose to Toes Lesslie Perrot is better known for her co-authored books on marriage with her husband, but this is a great foundational book about how we were specially made. God loves us and made us just the way we are. Found Psalm 23 retold by Sally Lloyd Wright and illustrated by Jago. Beautiful. Simple. Words of comfort and love. God is Good All the Time This title puts me in a packed out Black Church in Georgia, with the familiar call and response God is Good, All the Time. It goes through the good things of a child’s life and names the goodness is found in God. Global Babies This is a secular book, but is by the global children’s fund and all proceeds go to the fund. And, really this book lays out the baby gospel in a simple and clear one sentence about how babies everywhere are loved. Bonus: Bishop Desmond Tutu’s God’s Dream. This is one of my favorites, but because it was originally a picture book rather than a board book, its a little too wordy for most kids under 2. Last year we had a lovely 4th of July, BBQing with friends topped off by watching fireworks at Winnamac Park, which is by the way, one of the most amazing unofficial fireworks shows in Chicago. A friend offered me a camping chair to sit on, which was generous considering that sitting all the way on the ground when I was overdue by a few days with my second baby was quite uncomfortable. Thing #1, at two-and-a-half-years-old was in awe of each firework. And then I stood up. Suddenly, I felt very strange and my belly was heavier than it was before. I waddled to my friends place to pee and was very quiet on the way home. Mr. Tall Dark and Handsome (TDH) put Thing #1 to bed and came downstairs to see me staring blankly at my phone while lying on the couch. “Why aren’t you in bed?” he asked? “Just taking inventory of my body,” I said. I had been having contractions the last few nights before bed, but kept going to sleep only to wake up hours later with nothing happening so I was hesitant to say this was any different. Except it was, they were coming fast. I sent my Doula a screenshot of the timing of my contractions. They were coming so fast, she assumed it was dehydration at first and so I drank a box of coconut water. They slowed slightly, but their length increased. She told me to call the midwife. The midwife said, since it was my second baby, I could come in. I called my Dad to come stay with Thing # 1. And then they got intense. I had the yoga ball in the shower with me…the shower felt good, but I knew I needed to get out of there. “Pressure!” I yelled. TDH pushed as hard as he could on my lower back. Knowing what I know now, I should have called my neighbor over to stay with Thing #1, but my first labor was 60 hours, so the fact that it could happen fast didn’t seem real to me. My parents got there. TDH and my mom helped me in the car and we left. I told TDH to put “Oceans” by David Crowder on…not sure why except I like that song and I had read some natural birth quote that talked about contractions being waves washing over you. I cursed Ashland Avenue all the way up to Evanston just as I had with my first labor. I blew raspberries trying not to push. And then the baby started coming. I knew it was happening. There was nothing I could do. I’m pretty sure I crapped my pants at that point, but I was too far gone to care I was just sure the baby was next. We got to parking lot and I said, just go in and get someone to assist. “No” TDH said, and he dragged or carried me, I’m not sure in the hospital. At that point I started yelling, “De-bbie! De-bbie! There was no way I could get up on a bed at that point. Someone lowered the bed as low is it could go and I got on on my hands and knees facing the wall and away from the hoards of onlookers. Debbie, my midwife was there and gloving up. She said she was assisting a first timer and had heard me calling. Like breathing in and out, I would push out when there was a contraction and let the baby slightly come back in in between them. There was a simple rhythm to the whole thing, a rhythm I had trouble finding the first time. Later I learned that Debbie had to quickly untangle the umbilical cord from the baby’s neck and along with the meconium that was why he had to be examined by a pedestrian right away. But I felt so empowered by the experience and having heard him cry I wasn’t worried. The placenta took longer to birth than the baby, and when I looked at the discharge papers his birth was listed as being 6 minutes. We were so happy. 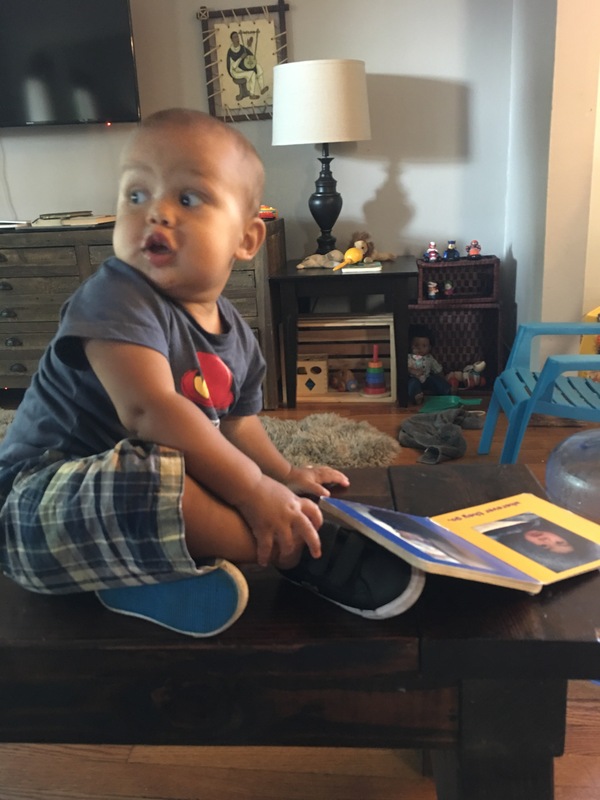 We named him Simeon after the prophet who recognized who Jesus would be at the temple when he was presented as a baby, Justice in the hope that he would be a person who stands up for justice in an unjust world. And Negussie as his Ethiopian family name. Though babies aren’t born with the capability to smile, his smile is so contagious that it is hard to remember a day without it. I love him so–even though he’s still not sleeping through the night! If you love reading birth stories, check out the book Birthing from Within and my first birth story.